PKZ2/ZM/S-SP Klockner Moeller self-protected combination starters include disconnect, short-circuit protection, adjustable overload and contactor - all in one compact unit. Klockner Moeller was the first manufacturer to comply with the new UL/CSA standard for self-protected combination motor starters per UL 508 / CSA 22.2 No. 14 Type E.
The built-in current-limiting features of these units provide short circuit interrupting ratings of 100kA @ 240 volts and 65kA @ 480 volts, thereby preventing contact welding. The overload trip shuts off the disconnect switch for more positive protection. The units include a red pop-up trip indicator on the disconnect. The optional ZMR version includes auxiliary contacts on the motor overload. These are not necessary to the operation of the unit but are useful for remote fault signalling or to drop out the contactor's control circuit. 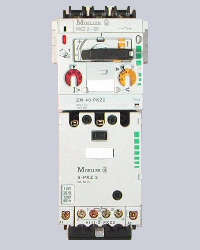 includes disconnect, trip unit, trip indicator and contactor. Always specify control voltage for contactor. complete units, including overload trip indicating contacts. requires plug-in trip unit from chart below. requires base unit shown above.